Here is a video of the gardens which caught my eye at Chelsea. The aim was to balance the designers’ accounts with critical comments but I have given too much time to their puffs and not enough to myself (!). Shooting the video gives me a keen appreciation of the BBC videographers’ skills – and an envy for the 25 person crews they use for the ‘filming’. My first impression of the gardens on the Main Avenue was of a nineteenth century style revivalism. ‘Is 1850 the future of British garden design?’ I asked myself? The M&G revival of ‘Persian’ ideas was a prime example in this category – and is not included on my video. My vote for the best Show Garden goes to the Cloudy Bay garden and, nearby, my vote for the worst garden on the Main Avenue goes to Alan Titschmarsh (also not on the video). The ‘hilly bit’ at the back of his design was quite nice but the ‘summer house’ and ‘pond’ were awful. The BBC was right to replace him with Monty Don as their lead presenter but Monty looked frail and I worry that he is taking on too much work. If Monty finds it too much it will be a real pity if they go for Joe Swift as his replacement. Joe’s horticultural knowledge may be OK but his design judgement is jejune. OK, I know it is the Chelsea Flower Show, but I find the gardens more interesting than the flowers and a goodly proportion of the TV coverage is about the show gardens. This entry was posted in Garden Design on 22nd May 2014 by Tom Turner. Why do so few children cycle to school in the UK? Congratulations to Northern Ireland Greenways for a super set of infographics (+ thanks for permission to reproduce the above pic). 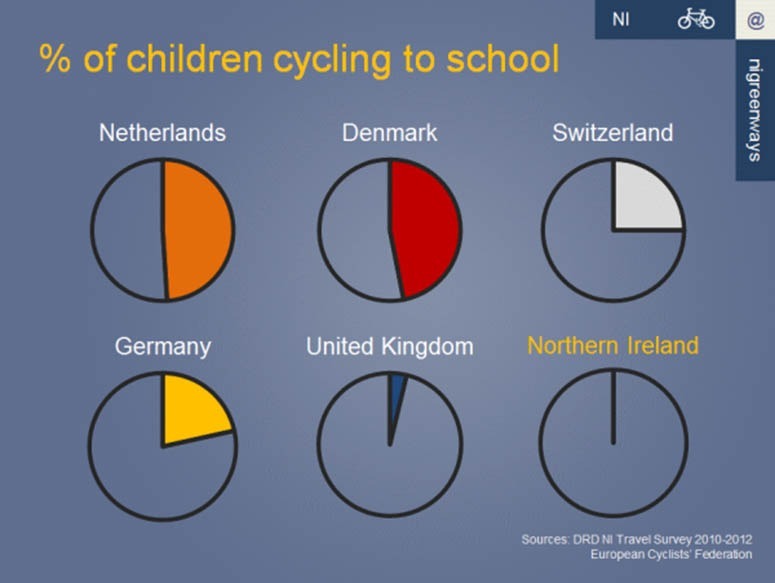 Of the chosen countries, why does the UK have the lowest figures for cycling to school? Does the UK have colder weather and higher mountains than Switzerland? Is it windier than Denmark and Holland? Is the UK’s GDP so much higher than Germany’s that we all have big cars? Or is the UK governed by blockheads who prefer cars to bikes and therefore employ legions of highwaymen and hardly any landscape architects to plan the country’s transport infrastructure? I incline to the last of these explanations – but we have a Mayor of London and a Prime Minister who are both keen cyclists. So there may be another explanation: the UK has over-strong central government and lapdog local government. The Whitehall bullies and barons keep asking themselves ‘What does THE COUNTRY need?’, Nobody can take locally relevant decisions to benefit local people. Switzerland has the best system for subsidiarity and local decision making. My guess is that were it not for those pesky Alps and snowdrifts it would have the best cycle infrastructure in Europe. This entry was posted in Cycle planning on 22nd May 2014 by Tom Turner. Modernism, said Charles Jencks, died with the demolition of the Pruitt-Igoe housing project in Chicago. Post-modernism appears to be dying with the demolition of Marco Polo House in London (see video). Post-postmodern (Post-POMO) design may arrive when designers recover the confidence to blend reason with beliefs eg in Vitruvius’ design objectives: design should be functional, multi-objective, sustainable and meaningful. There was something really good about modernism, because design should be functional. And there was something really good about postmodernism, because design should be multi-valent. But something will always be missing if design is based on reason alone: for Commodity, Firmness and Delight, designers must also hold beliefs. PS of these three words, the most problematic is ‘Delight’. It suggests the type of pleasure you get from a pudding, like Raspberry Delight, rather than the more serious objectives which have led the development of the arts from century to century. This entry was posted in Urban Design on 8th May 2014 by Tom Turner. Glasgow had the witty idea of blowing up the last of the Red Road Flats to celebrate the opening of the 2014 Commonwealth Games. There was an outcry, a petition and they decided not to do it. But the flats are still doomed and we have to keep asking ‘what went wrong’. Auberon Waugh (see quote below) blames the architectural profession. I see Sam Bunton & Associates as accessories to the ‘crime’ but believe the main responsibility lies with the client body: Glasgow Corporation. Instead of giving poor people ‘housing’ they should have given those people the money they needed to buy or rent accommodation. The socialist principle was well-intentioned but mistaken. 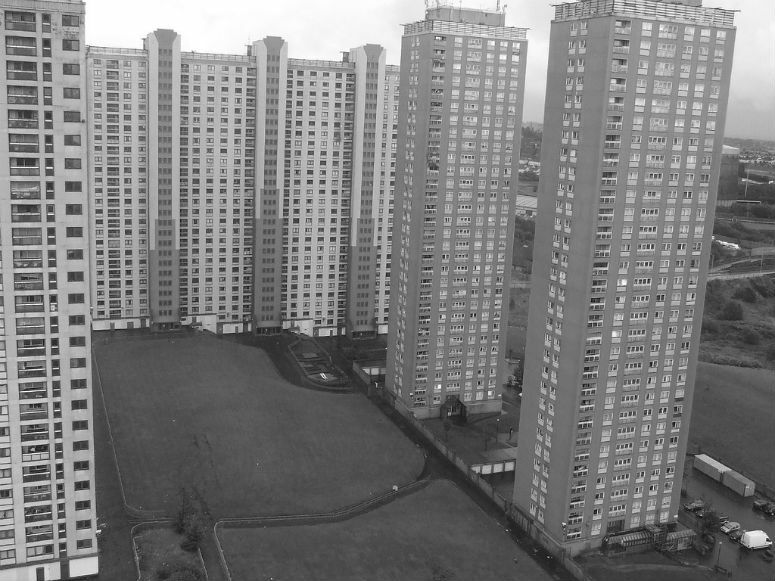 I remember visiting Glasgow ‘estates’, like the Red Road, in the 1960s and finding the ‘landscape areas’ between the blocks strewn with broken glass. I do not know what they had been smashing but there must have been a lot of it. In recent years the blocks have been occupied by asylum seekers. Had I happened upon this image on the web, I would have guessed it was in East Asia. So one wonders: will the Chinese be thinking about dynamiting places like this in a few decades time? I think they will, and some of the credit will belong to Michael Wolf’s work on the Architecture of Density. This entry was posted in Urban Design on 1st May 2014 by Tom Turner.